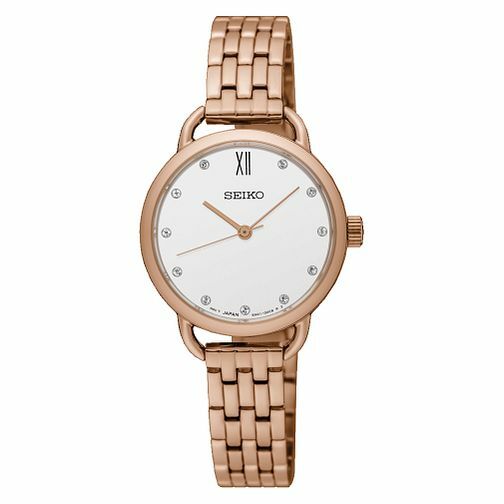 This ladies' dress watch from Seiko is elegantly styled with a rose gold-plated stainless steel bracelet strap and case and a beautifully simple white dial set with crystal to show each hour marker. This watch is perfect to be worn everyday or as a watch just for those special occasions. Seiko Ladies' Rose Gold Plated Steel Bracelet Watch is rated 4.0 out of 5 by 1. Rated 4 out of 5 by Anonymous from Beautiful and elegant I got this as an engagement present from my fiance and I haven’t taken it off since. It is very lightweight, has a beautiful soft pink hue to the rose gold and the crystals inside complement it’s simplicity.